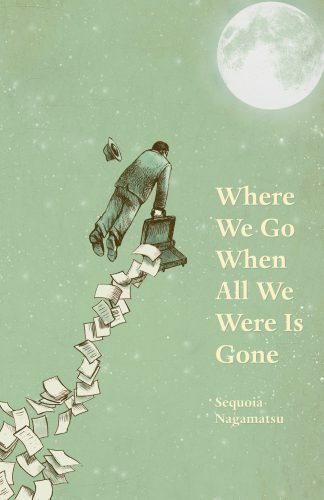 Ultimately, Sequoia Nagamatsu’s anthology Where We Go When All We Were Is Gone is about our relationship with stories. It’s particularly about the ones we tell each other and ourselves—the way they reflect our best and worst intentions, our hopes and our fears. All of the characters seem to believe in some kind of myth. Sometimes that myth is one they invented. Other times, it’s the byproduct of a mysterious world, deep and treacherous and occasionally wonderful. Nagamatsu explores these stories, personal myths as well as actual legends, by weaving Japanese folklore together with modern magic realism. Most of the short stories in the collection are preceded by a found object of that story’s world: a recipe, a pamphlet, a to-do list. These objects ground each story in a curious mundanity, as though the world is indifferent to the magic in it. Nagamatsu's mythic figures aren't omniscient or all-powerful; they are often stranded, ripped from the magic forest and lost in the big city. In the first story, “The Return to Monsterland,” the old monsters—or Kaiju, Japanese for “strange beast”—from Godzilla movies are a pantheon of old gods. They are created and forgotten by humans, living and dying and occasionally being reborn like forces of nature. The monsters are a source of fear and fascination, kept in a Kaiju village on the resurrected continent of Mu. The story ends with a plea from the main character to his daughter, asking her to help him see what drew Mayu to the Kaiju. It’s inconceivable to him that something so terrifying can be beautiful, but he wants to believe. We see this kind of coping again in “The Passage of Time in the Abyss,” where two brothers tell each other stories about what may or may not have happened to their father, who drowned. Tamo, the elder, tells his brother Kogi the legend of Urashima Tarō, a fisherman who visits the Dragon Palace under the ocean. The story within a story is interesting to read, since the legend of Urashima Tarō is well-known in Japanese culture, but it’s made more so by the fact that Kogi rewrites the ending of the story twice: once, because he scoffs at the original ending, and another time in desperate denial when, in a horrible storm, his brother is swept overboard. He places their figurines in a massive miniatures display at the Tobu World Square, a sprawling riot of various landmarks: the Statue of Liberty right next to Versailles, the Parthenon, and all the skylines imaginable. As he does so, he remembers the various voyages they’ve embarked on and imagines the journeys they never took. He also recreates her accident and what would have happened if they could have avoided tragedy. “Girl Zero” similarly involves trying to heal heartbreak with folklore, though here this involves supernatural means. After their daughter Kaede drowns in the community pool, Tatsu seeks the help of mysterious creatures underground. When he brings a piece of her hair to them, all seventeen of them morph into versions of Kaede, forcing him to brutally drown sixteen of them so that he can bring one back. The creature he returns with appears to be Kaede, but she behaves oddly. She can’t speak, her eyes change color, she heals instantly when wounded, and she has to relearn everything. His wife Yumiko seems to stubbornly cling to the hope that it’s truly Kaede, but Tatsu has doubts. The underlying struggle in “Girl Zero” isn’t just that Tatsu isn’t sure if their little girl is really back. It also touches on the fact that Kaede was born with special needs, and there are moments where the new version of her seems to be able to do things that the previous her didn’t. By the end of “Girl Zero,” the original Kaede is back, and her parents are enormously relieved to have their little girl return. Even so, the story has planted the question of who exactly a person is and how to tell a loved one from a near replica. Is it their memories? Is it our memories of them? Nagamatsu’s stories each have a kernel of humanity, contextualizing supernatural events with emotional reality. The most successful ones are where the fantastical elements feel incidental, part of the reality, yes, but also the emotional landscape of the characters. You also get the feeling that he just had fun with extracting modern meaning from lore and updating stories to the twenty-first century. “The Inn of the Dead’s Orientation for Being a Japanese Ghost” is a personal favorite—it’s structured as a FAQ for newly dead and possibly vengeful spirits, and includes Q&A sections and tips for how to best haunt the mortal coil. Some of the stories in Where We Go When All We Were Is Gone are straight-up fairy tales, such as “The Snow Baby” and “The Peach Boy,” which are a little less interesting to read than the less conventional stories around them. Framed by the rest of the collection, though, they make sense: The rest of the stories look forward, while these two look back. They are purely magic, living in worlds where a boy born in a peach pit can marry a girl and plant peach trees to bear children. If you view “Where We Go When All We Were Is Gone” as a question, the answer might be that all we were would never be gone—not completely, anyway. As Nagamatsu shows time and again in his stories, those things we used to be and the things we used to believe will always be woven into the fabric of whatever comes next. Stephanie Chan is a writer and editor based in Brooklyn, NY. She can be found online at www.stephchan.com and @sweijuchan.